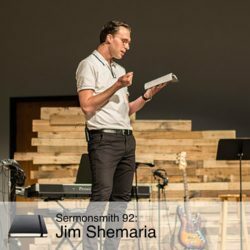 Jim Shemaria is the pastor of Celebration Bible Church in Grandville, Michigan (a suburb of Grand Rapids). He grew up in Seattle, moved to Michigan for school in 2003 and began working at Celebration in 2008. Jim loves the intimacy and community of small church ministry and divides most of his time between preaching and congregational care. He has also cohosted the (soon to be revived!) Pastoral Calling Podcast which focuses on the joys and struggles of pastoring small to midsize churches. Jim lives in Grandville with with wife Natalie, his 18-month old daughter Ila, and his retired racing greyhound Stamford. He enjoys a good cup of coffee and is an avidly long-suffering fan of the Seattle Mariners.